Let’s start with some context: I’ve just eaten a Mini Cheddar sandwich, followed by a lemon curd yogurt, that’s more of a dessert than breakfast item. This should give you a pretty good idea of my mental state at 34 weeks pregnant. 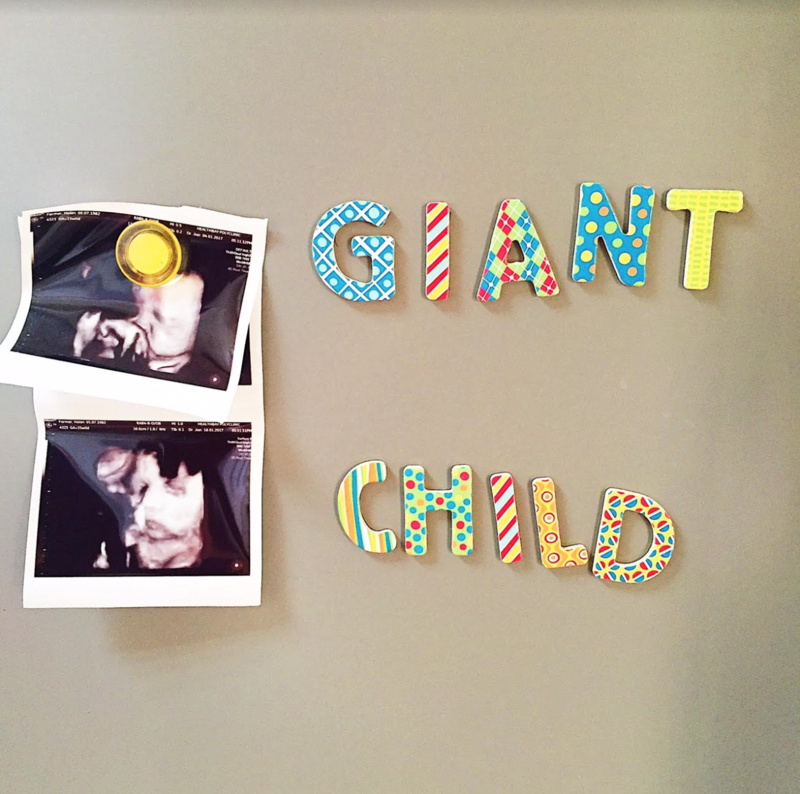 So last night we went for a scan, and the ‘very big baby’ news continues. This little chubster is measuring ‘average’ – for 39 weeks. She’s a month ahead of schedule. Her estimated weight is 3.1kg, which is more than Phoebe’s birth weight. Shiiiiit. The doctor chuckled at my horror, and told me I’ll be fine. How does he know? Apart from decades of experience, of course. I’m not convinced, and my eagerness for medical technology to advance considerably in the next month so this baby arrives via osmosis has been increased. A lot. Thankfully, I’m part of a lovely Facebook group of Dubai women due around the same time as me, and over the last few weeks, photos of the new arrivals have been posted. It’s a funny feeling – a mix of jealousy and ‘oh good grief this bump is actually a baby and when it arrives I’m going to have to deal with it and it’s so much easier now’. Mainly the latter, I admit. It’s also really reassuring to have fellow waddlers (as my husband called pregnant women) asking questions that have been bothering me too, or just sharing their concerns, so no-one feels like they’re going through it alone. Earlier this week someone asked if anyone else ‘Felt like they’ve been kicked in the crotch’, which perfectly sums up my current pelvic situation. Eg agony. Walking or standing for very long gets SORE, with the vague threat of the baby falling out. I asked the doctor, and sadly this is very unlikely. I’m going to sit down a lot just in case. The fetus is taking deep breaths. The eyes can blink and are open when it’s awake and closed when asleep, and the pupils dilate and constrict in reaction to light. Length: about 18 inches; weight: about 5 pounds. I STILL don’t understand the swallowing amniotic fluid thing. And it’s weird to think of her looking around in there. She was having a nap when we had the scan yesterday, and did a big yawn, so let’s pray for a sleepy baby (and people keep telling me that bigger babies are better sleepers – they’re not just trying to calm me down, are they?). As for the weight… Ha! We’re looking at closer to 6lbs 6oz, with a month to go. Sob. Your baby’s brain is forming trillions of connections, making it possible for her to learn in the womb. All of this brain development may be the reason that your baby sleeps frequently at this stage. She may even be dreaming—her eyes dart around rapidly just as an adult’s might in REM sleep. Your child’s development is in no way complete at birth. In the first year after birth, a baby’s brain triples in size and becomes three-quarters of its adult size. Note to self: eat brain food for the kid. More fish, fewer Mini Cheddars. The volume of your uterus is five hundred to one thousand times larger than before you got pregnant, so it’s safe to say you’re feeling huge and slow. You’re still running to the bathroom frequently and probably will from here on out. Try to drink a lot of water early in the day, so you don’t get thirsty at night and make things worse. What the… WHAT?!! A THOUSAND times larger? Huge and slow is right. Pretty sure my pelvic floor going to be in tatters after this pregnancy, but the doctor assures me that doing Kegels before she comes (am now doing Kegels while eating Mini Cheddar crumbs) will help, but there’s not much else to do until after the birth. If you haven’t purchased your baby’s car seat and installed it, do it now. You’ll also want to start thinking about what you want to pack in your hospital bag. Thanks to everyone who commented and shared my post on the importance of car seats earlier this week. You can read it here. It’s not something I can stress strongly enough, and the more awareness we can spread the better. It’s a truly shocking thought that newborn babies leaving UAE hospitals don’t need to be properly strapped in. Re the hospital bag, it’s a work in progress. And we need to buy more Mini Cheddars as I keep eating them. For my tips for what to pack when you’re delivering in Dubai, click here. If you’re close to the end too, how are you feeling? Competition – win a hotel stay, spa visit and babysitting.